Mt Currie North Face - Spring Conditions. A massive, multi-summited mountain located south of Pemberton, just north of the Garibaldi Provincial Park boundary. The southernmost summit is the highpoint. The north face is about 2300 m high and offers good extreme skiing gullies when in condition. Some parties have climbed Mount Currie via its easy south slopes, which requires a multiday approach from the Wedgemount Lake area. The most direct route is to climb one of the major gullies on the north face, which is best done on firm snow. The west side also offers a steep but direct hiking approach. 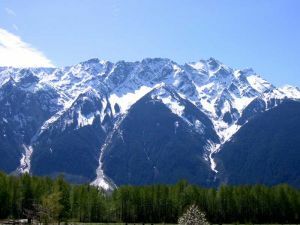 Name Notes: Mount Currie was named for John Currie, the first permanent non-native settler in the Pemberton Valley, who married a native woman and whose descendants are still in the district today. The Currie Ranch was at the mountain's foot, west of the head of Lillooet Lake.